And most of those infected with the virus do not know that they have it, which means they could easily be spreading it to others via exposure to blood-or, occasionally, sexual contact. Yikes. The problem is the symptoms of hep C — depression, joint pain, fatigue — are pretty vague and non-specific. I mean, going by those symptoms, I have had it for years. 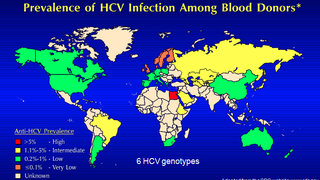 But apparently more than 15,000 people died from hepatitis C-related issues in the U.S. in 2007. That number is expected to double as people with the disease get older. Anyway, there are some drugs coming to the market, but they're frighteningly expensive. ("One, a protease inhibitor called boceprevir, runs about $1,100 per week.") The good news is that Hep C can often be cured after six months to a year of antiviral treatment. But still: The map (above) is scary. What the hell is going on in Egypt?! Image via the Gale Lab at the University of Washington.